Come move with friends new and old in the embrace of Spring’s awakening! We melt away the layers of winter, find our flow, and re-energize in the dance of Contact Improvisation. Open to all ages, backgrounds, levels, and styles of dancing. Nine Mountain is not available for Earthdance guests during this event. As Earthdance runs as a​ community, all participants contribute to 1-2 chore shifts (typically meal cleans) throughout the Jam and a Final House Clean from 2-3pm on Sunday, March 18th. These are great ways to connect more with your fellow participants, Earthdance staff, and to feel more at home here. We will be welcoming you into this collective home and thus so appreciate your contributions to our space! 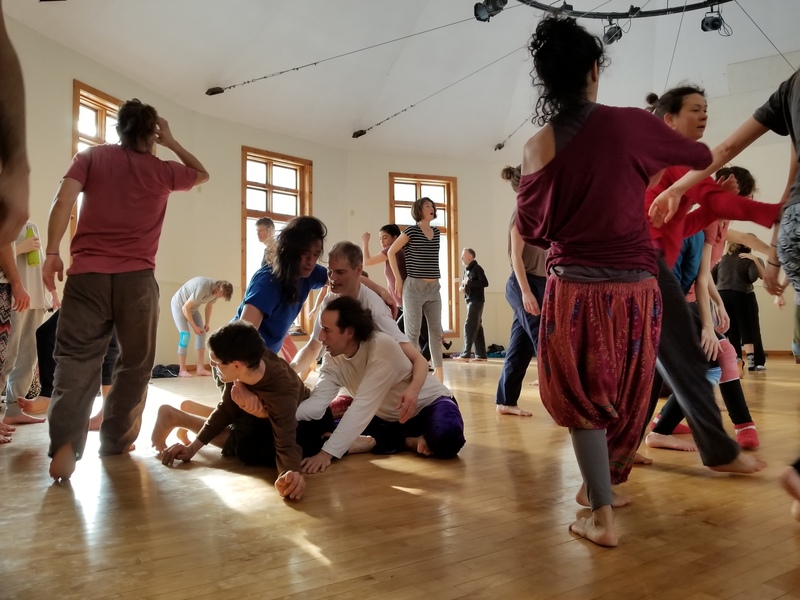 We are mindful that we come together to dance at a fraught time in the broader culture and we want to engage with Contact Improvisation as a practice of resilience and compassion, humbleness and transformation. Ultimately, we want to accept the Springs invitation to refresh and rejuvenate by dancing together so that insight grows from the seeds of our intimate experience towards broader actions of justice and joy. Contact Improvisation is an amazing practice that cultivates the resource and intelligence of our whole bodies. In dancing together we exercise awareness, sensitivity and strength that can serve as pathways for growth, compassion and transformation— of ourselves and of each other. We want to push the wisdom of Beginner’s Mind in our dancing. Rather than assuming how much we know about ourselves, each other and contact improvisation, can we be skillful in not knowing? Can we throw ourselves into not knowing such that our nervous systems and social systems might be newly noticed? We want to explore CI as a practice of empathy— with the possibility of being touched and changed by that which is not already part of the story of ourselves. In this way we wonder if practicing Difference might be more precious than practicing Consensus as we dance together. Can our differences as we jump and play, roll and touch, zoom and float and fall through space— become shared resources in our dancing together? Can we empower our ability to be affected and changed by each others differences? Instead of rehearsing and perfecting narratives of who we are as dancing bodies, can we open up our narratives with a sense that there is much more to come— that what we have yet to know might be illuminated in us from light refracted through others? Acknowledging that we have many ways to see this Jam and engage with this theme, feel free to bring what will support you to explore your perspectives and try on something new. You may want to bring a journal to draw and write in. There will be a space created for objects to be placed and witnessed. The invitation is that they may represent something you want a new perspective on. You can prepare for the jam by choosing an object to bring or see what comes to you once you arrive. You are always welcome to make new or different choices once you arrive. You can take back your objects at any point. If you have any offerings you'd like to share during the jam (music, workshops, etc.) please email the CI Committee at cicommittee@earthdance.net. The CI Committee is the first stop for communications. They will pass along offerings and information to the facilitators. Thank you!